Discover the colonial history and precision planning behind this exhilarating island city, where students can soak up the sights and expand their scientific and civic planning knowledge. This global finance centre near the equator is at once relentlessly practical and gorgeously tranquil, offering world-class gardens, fascinating colonial relics and industry-leading science and banking facilities for exploration. Singapore City Gallery Learn about the city’s remarkable physical transformation at the Singapore City Gallery. Marina Barrage guided tour Take in the impressive sights of Marina Barrage during a guided tour including Sustainable Singapore Gallery, Green Roof, Solar Panels and the Marina Barrage. 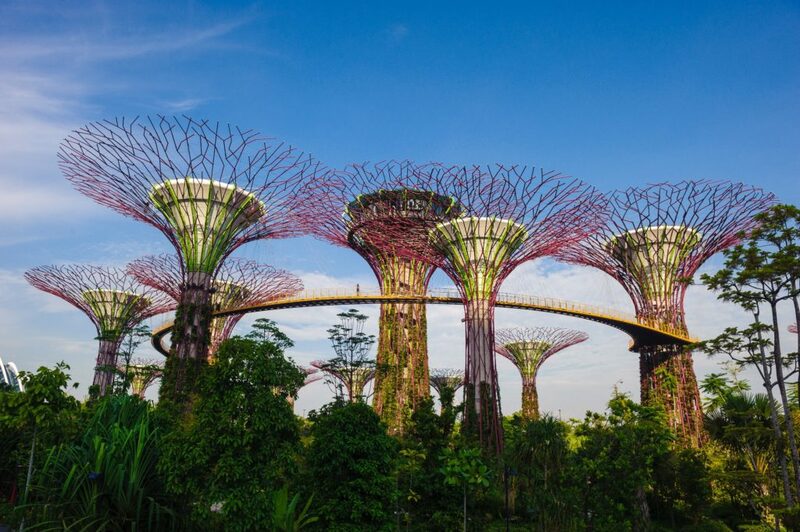 Singapore’s Gardens by the Bay Be inspired by the beauty of Singapore’s Gardens by the Bay. Singapore Science Centre Broaden your knowledge with a wide range of science enrichment programs at the Singapore Science Centre. Universal Studios Delight in a day of adventure and excitement at Universal Studios. Day of learning Enjoy a day of discovery with visits to Singapore Flyer, Information and Communications, the Technology Experience Centre and the Land Transport Authority. FusionWorld Be immersed in the latest cutting-edge science and engineering technologies during a guided tour of FusionWorld. Mediacorp Go behind the scenes and experience the magic of media during a guided tour of Mediacorp. NEWater Study the science behind Singapore’s clean water supply during a tour of NEWater. Singapore Maritime Gallery Learn about Singapore's maritime history at the Singapore Maritime Gallery. Singapore Art Science Museum Discover creativity at the Singapore Art Science Museum. Singapore Cultural Tour Embark on a cultural city tour of Sinagpore, with visits to Parliament House, City Hall and Merlion Park. Bumboat River Cruise Enjoy a Bumboat River Cruise along the Singapore River, taking in colonial buildings, traditional Chinese shops and modern skyscrapers. Night Zoo Safari Venture into the wild on a night zoo safari. Thank you for your interest in our WorldStrides STEM in Singapore Tour! Please tell us a little more about yourself so we can get you sent to the right place.